This vase by Anzolo Fuga, was created using clear glass (cristallo) which was decorated with vertical rods of opaque white glass (lattimo) and multi-colored murrine. Murrine are colored patterns or images made from a glass cane, essentially a long thin rod, whose pattern is revealed when the cane is cut into thin cross-sections. Murrine can be made in infinite designs from simple circular or square patterns to complex arrangements. Canes are created by forming molten glass into rods stretched to long lengths and to varying degrees of thickness. Intricate patterns are created by carefully assembling many different colors of cane and fusing them together to obtain the desired effect. The technique for making this colorful, free-spirited glassware was developed on the Venetian island of Murano, a centuries old haven to some of the world’s finest glassmakers. The origins of glassmaking in Venice go back to the time of the Roman Empire. Blending that experience with skills learned from the Byzantine Empire and trade with the Asian glassmaking centers, Venice emerged as a prominent glassmaking center as early as the eighth century. Venetian glass reached its peak of popularity in the fifteenth and sixteenth centuries. It was in the fifteenth century, that the process for producing cristallo glass, was devised. In addition, the popularity of Chinese porcelain among European nobility fueled the development and production of lattimo, the white glass which mimicked porcelain. Through the centuries, Murano has remained a center for innovative glass work. Muranese glassmakers remained staunchly dedicated to traditional designs until the twentieth century when styles like Art Nouveau and Art Deco started to influence their work. World War II interrupted the glass industry, but it bounced back in the post-war years. To support a new world of design trends Muranese makers returned to techniques of the past such as filigree, murrino, and lattimo, but used those methods to create modern, sleek pieces that focused on minimalism and function. Anzolo Fuga came from a family with long ties to Murano and its glass industry. He played an important role in the mid-twentieth-century glass revival when he started work as a designer for Arte Vetraria Muranese, known as A.Ve.M, in 1955. Fuga’s training at the Istituto d’Arte di Venezia between 1934 and 1939 allowed him to mature as an artist, working in the graphic arts, watercolor techniques, and in the art of stained glass, which continued as his primary medium of exploration for the rest of his career. Fuga’s simultaneous work as a stained glass artist while at A.VE.M informed his use of color and his understanding of the interaction of color and light, both integral parts of his glass design. During his time at A.VE.M, Fuga would experiment with three or four new models in a single day. His work could be viewed as variations on a theme. 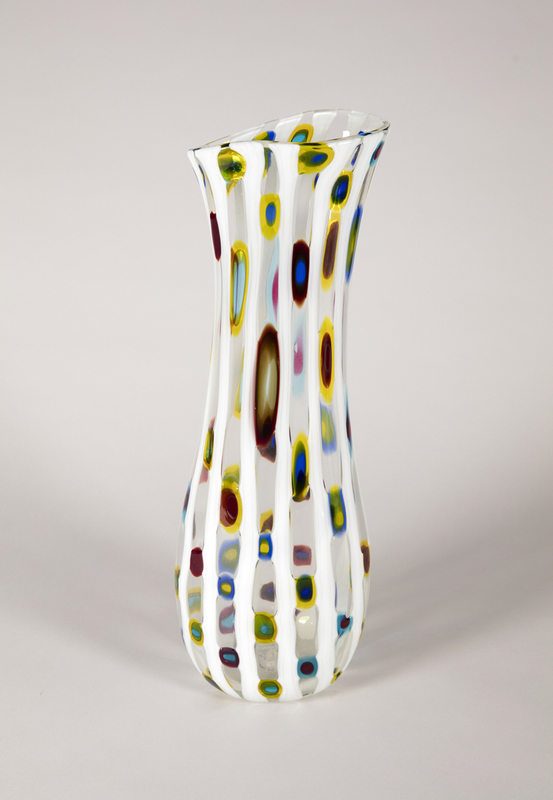 This vase shows white areas of lattimo glass interrupted by stripes, rods, and dots of multicolored glass that are inlaid or overlaid. This sprinkling of colorful slices interspersed with longitudinal lines are expertly worked and give a sense of depth to the vase. It appears as if the multi-hued disks are floating independently, falling to different planes within the glass. Fuga continued to create glass for A.VE.M. aided by his son Flavio, who, after Anzolo’s death in 1998, continued his father’s work.